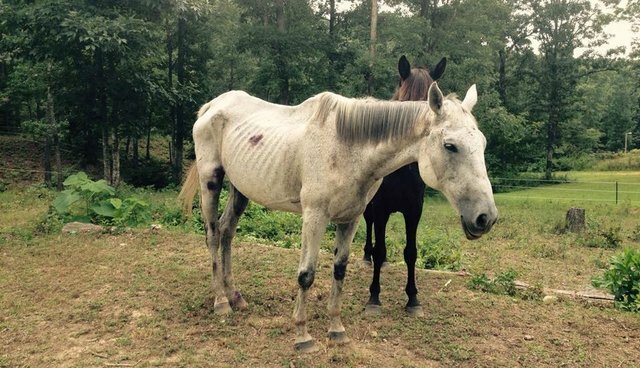 What Happens To Racehorses Who Never Win? Bear Witness had quite the lineage. He was the grandson of legendary racehorse Secretariat and the son of Lady's Secret. 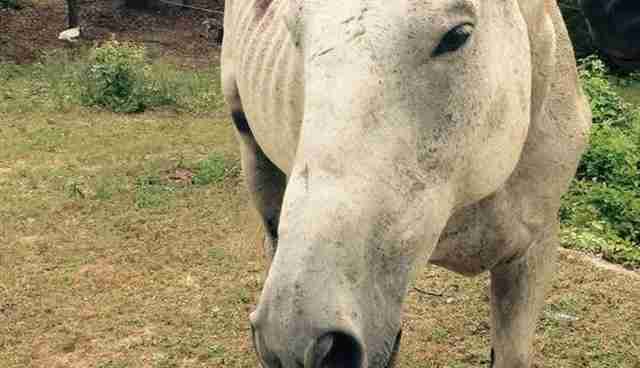 Yet he was found on July 24, 2015, at a horse auction in Tennessee, suffering "many obvious signs of neglect, abuse and starvation," by a woman named Jessie Kunz, who has since created a Facebook page in his honor. It took a month for Kunz to gain the horse's trust. "I couldn't even touch his face he was so terrified," she said. "He had a big, bloody open wound on his back leg," Kunz said. "He hadn't been fed in a month and his hooves had not been maintained - they had not been cleaned out, shoes checked, kept moist. He could barely stand or walk." Originally from Germany, Kunz says she had never been to a horse and tack auction, where various farm animals and gear are sold, in Tennessee before. What she saw there horrified her. Bear was covered in rain rot, a bacterial infection of the skin that causes scabbing and hair loss, from head to tail. "He was down from 1,400 to 500 pounds," Kunz said. "People were shocked at the cruelty. I just couldn't stand it. I went to [Bear's owner at the time]. He took $250 and I took Bear home." A month after being moved to Kunz's care, Bear slowly started gaining weight and trusting people again. "He must have been very scared," said Kunz. "It was, for me, a wonder that he even still liked being around humans. His body was covered in scars, as was his face. He had a bad hoof abscess, which we treated. He needed a lot of groceries and vet care." While the precise chain of custody and responsibility is not yet known, there is one thing of which Kunz is sure: "I think the world should know how mean humans can be." Bear may have suffered this fate, according to Kunz, because he had the misfortune of being born from a line of champions, but never himself "finishing in the money," or placing in the top three in a horse race, which guarantees the winner a share of the prize money. Initially, Kunz set up a GoFundMe campaign to try and raise money for his care. Sadly for Bear, help may have come too late - he died in October. 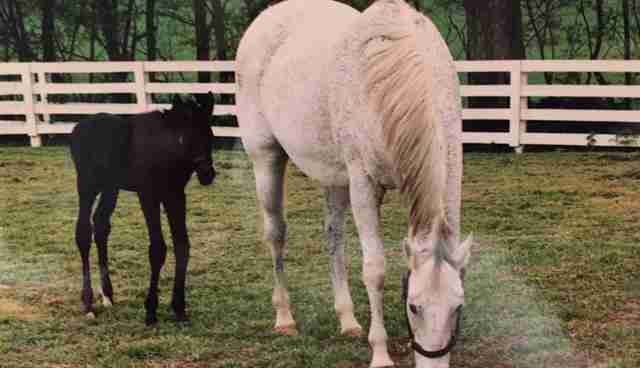 While many believe the horse racing industry is on its last legs in many places thanks to increased awareness of the issues facing racehorses, many of them are still being born and bred only to spiral down into an existence of neglect, starvation, suffering and eventual slaughter. Bear Witness was born into this system of abuse on April of 2000, despite the good intentions of his trainers. 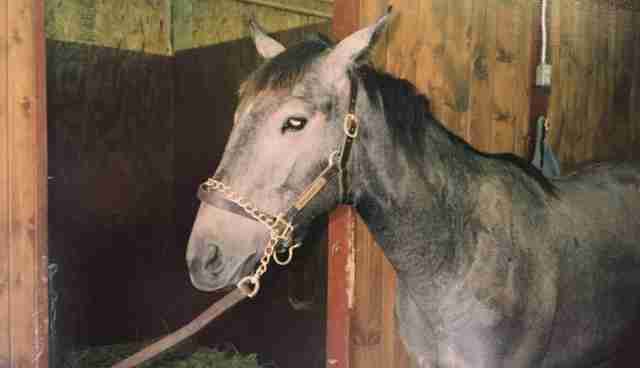 He was bred by John and Kim Glenney, who were opposed to the industry abuses they witnessed. Seeing what happened to horses on various race circuits is what eventually led them to quit the business, they told The Dodo. 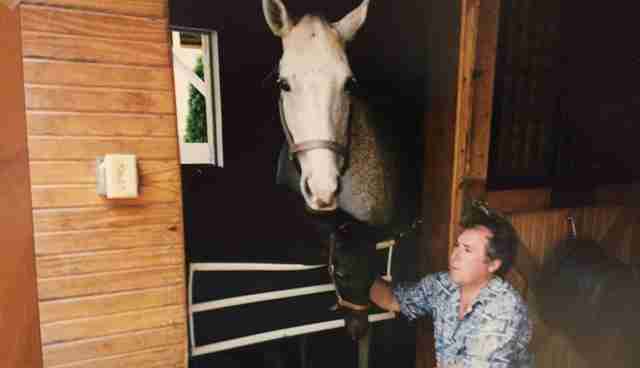 The Glenneys were among those trainers who treated their horses more like family than win-at-any-cost possessions, according to those they hired to help them care for Bear and over 100 other horses over the years. Unlike his sire, the male parent of a horse, Bear was not a big winner. He raced 16 times, with his best finish in fourth place, just shy of ever taking home any winnings. 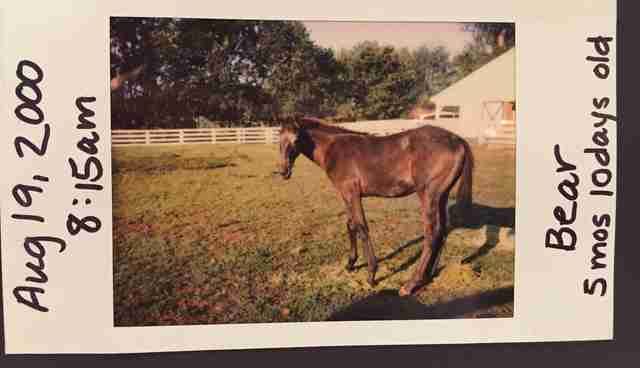 Like many racehorses who are not focused on the win, at some point, he was gelded - castrated. "When they have their testicles, they tend to want to mount the fillies [young female horses] and not concentrate on the races," Gail Matthews of Winning Hands, who treated Bear while he was owned by the Glenney family, told The Dodo. "Like all of the Glenney's horses, Bear got the best treatments, the best care possible. He was like family." "Horses are like people," John Glenney told The Dodo. "If racing isn't their thing, and we gave all our horses chances to show that it was, then they are retired and in many cases retrained to do something they will enjoy more, like dressage [skilled riding] or being a horse for children who need therapy that involves working with horses." Bear had more than just motivation issues. He had been a long-time sufferer of a parasite known colloquially in the industry as EPM, which causes disease in approximately one percent of exposed horses, according to the American Association of Equine Practitioners. He was given numerous treatments while in his family's care, including acupuncture and equine massage by Matthews and others, said Glenney. For these reasons, the Glenneys, who have since been out of the horse racing game for over a decade, retired Bear. He was suffering from a bout with EPM and had to spend months getting costly EPM medication and treatment before he was healthy enough to be given away to a new home, Glenney explained. "We always gave our horses away to trusted vets, trainers and people we interviewed and thought they would give them the right kind of home," Glenney said. "We interviewed the people we gave [our horses] to." In Bear's case, and in the cases of many other former racehorses, what began as a well-intentioned adoption went horribly wrong. Additionally, the circumstances of Bear's life between his retirement from the Glenney's care and his rescue by Kunz are quite murky. In an email acquired by Kunz, sent on July 10, 2013, by Kim Glenney to an unknown person creating a memorial for Bear's mother, Lady's Secret, Glenney wrote that Bear Witness had died of EPM. However, Bear was found by Kunz at auction on July 24, 2015. "I had heard that one of our horses had died of EPM at some point and I just assumed it was Bear because he'd suffered from it for so long," Kim Glenney told The Dodo. "When I learned the truth, recently, I just can't even think about what he must have gone through. It breaks my heart." "If I had known what was happening to him, I would have given [Kunz] any money she needed for his comfort," she said. "Bear Witness had suffered from EPM for years and we treated him off and on, but when my wife sent that email she didn't really have any firsthand knowledge of his death," said John Glenney, who is a biologist. "After he retired, we kept treating him and when he was sound and healthy, we found a good home for him. 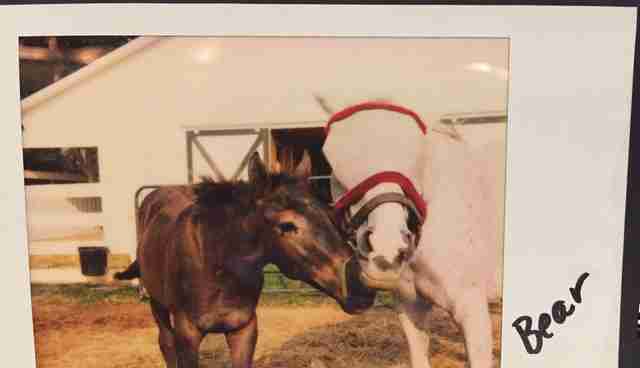 These were not just horses we bought and sold, they were members of the family with names and personalities." "I'm distressed to hear what happened to him," John Glenney said. "We left the horse game and we've rescued some of our own horses that ended up in lower-level races or weren't being provided for, and we've paid to have them shipped back, even from California." "Like our other racehorses, we didn't sell him, we gave him away to someone we trusted would take the best care of him in his retirement," John Glenney said. "I don't know how many hands he went through after that." The post-race career horrors are not news to Glenney, however. "I know of some of the awful things that happen to retired horses and that's why we've tried to find them good homes," he said. "Even with the best intentions, as they pass from one person to another to another. We have pursued this a number of times." "We had one horse who had fallen down the ranks, and we tried to find him so we could buy him back. But by the time we found him, within a month or two, he ended up at the slaughterhouse," he said. "It was too late. We know what goes on and have tried to stop it. I've told every person I ever gave one of my horses to that if there was any reason it wasn't working out, I'd take the horse back. I'd pay to fly him back." "I believe the people who did this should be exposed," he said. Kunz said the National Sheriff's' Association was finally able to trace Bear by his lip tattoo - used by the Jockey Club (a breed registry for thoroughbred horses in the United States, Canada and Puerto Rico) for identification and registration purposes - and match his DNA to prove that, at age 15, this broken shell-of-an-animal was once a glistening, healthy horse. Kim Glenney said she spent many hours sifting through boxes of Bear Witness' baby pictures, after she was contacted by The Dodo for comment, "from his first sonogram at 18-days in utero, to when he was a fuzzy brown foal nuzzling against his mother, Lady's Secret." "I've spent this wintery day sitting on the floor of my basement surrounded by pictures and memories," she said. "I'm sorry for the reason I opened these boxes, but it's been wonderful to see all these buried treasures again." Kim Glenney and Kunz have since connected by phone, shared photos and memories and vowed that they will both bear the burden of knowing that, while Bear's suffering has come to an end, countless other former racehorses remain in purgatory. "They are out there right now, starving, freezing, abused, and who is helping them?" Kunz said. "Who is telling their stories? Where are the laws and the rescuers? It is up to us all to help them." Today, another GoFundMe campaign has been established by Kunz in order to help others who want to save horses like Bear from further torture. UPDATE: A previous version of the article stated that Bear Witness may have been kept at the Cowboy Church in Bon Aqua, Tennessee, according to a source. The church's pastor replied, "Our church does not own or store horses."